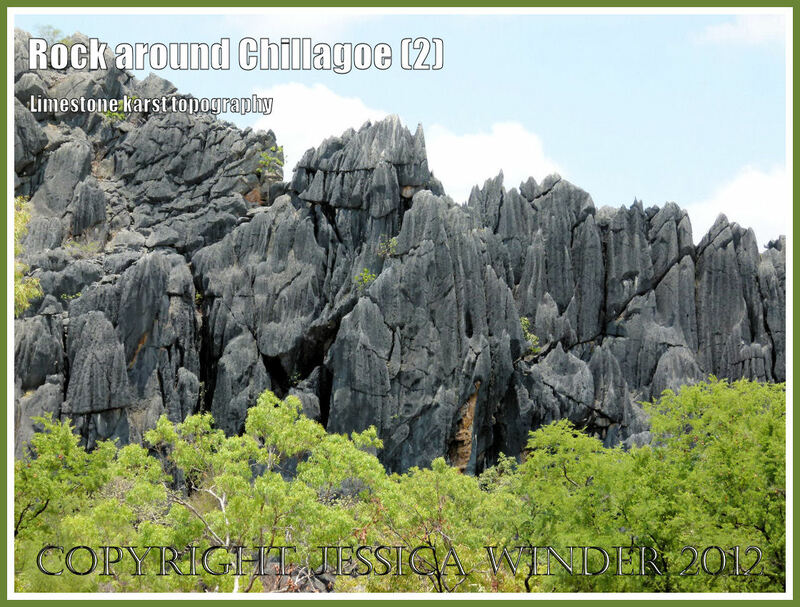 Limestone karst topography – the karst towers of Chillagoe district. One of the delights of travel is the opportunity to enjoy new vistas, to appreciate different scenery, and to learn a bit about the geological structures and processes that underlie and create the landscape. Getting away from the normal tourist destinations of the Great Barrier Reef and the rain forests of Tropical North Queensland in Australia, we headed west up the McAllister Ranges, through the Mareeba Wetlands, traversed the fertile agricultural areas, went over the Great Divide and into the Western Watershed where we saw a countryside of rolling hills rich in minerals – marking the beginning of the Outback. 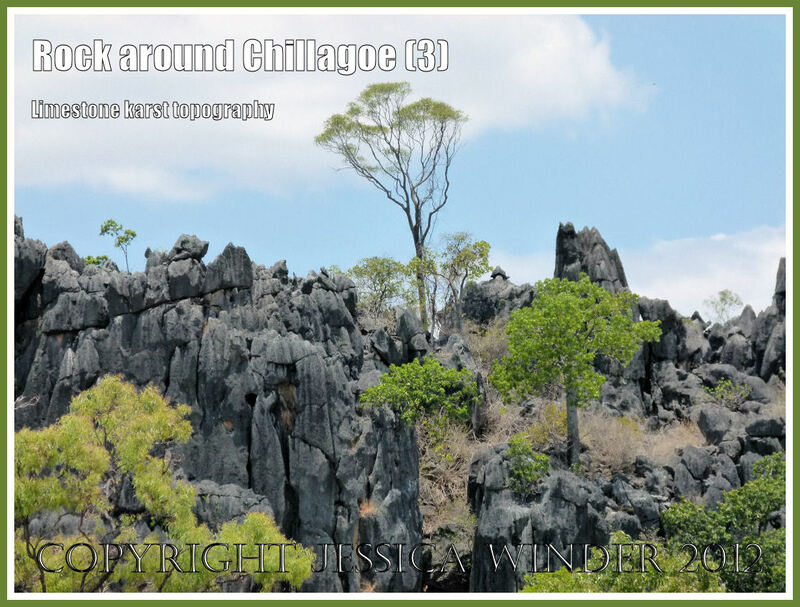 Near the small town of Chillagoe (population 200) the countryside was scattered with dramatic rock formations, or towers, made of limestone and composing a type of scenery known as limestone karst topography. 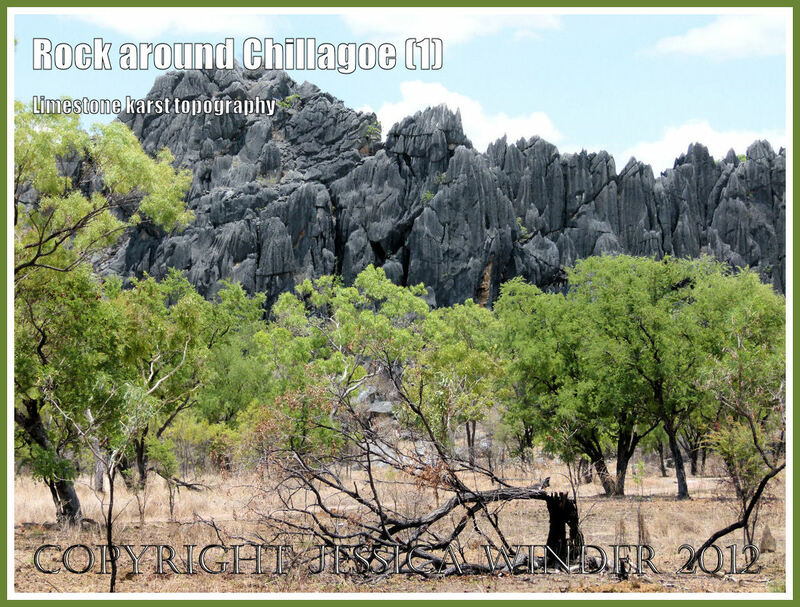 Chillagoe lies within a belt of limestone, approximately 5 km wide and 45 km long, extending from south of Chillagoe north-west to the Walsh River and beyond. More extensive belts occur as far north as the Palmer River. 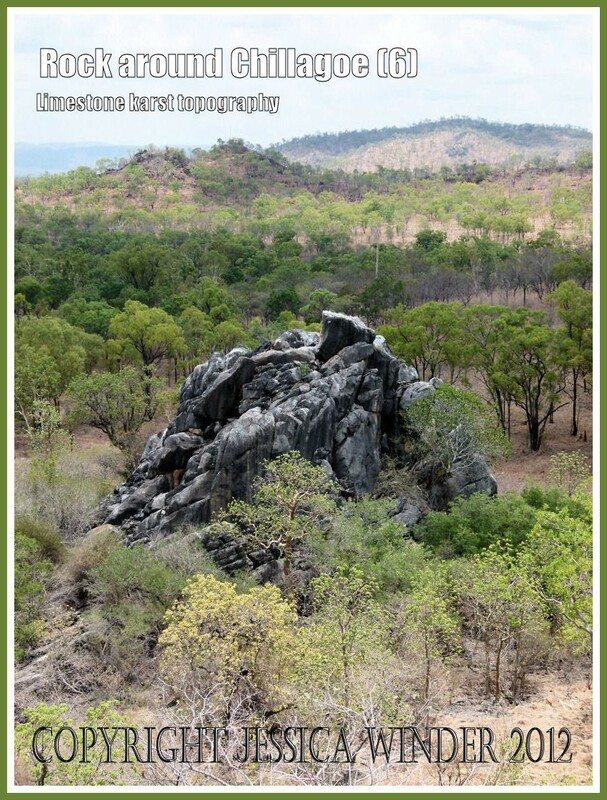 The limestone was deposited as calcareous mud and coral reefs approximately 400 million years ago, on the bed of a shallow sea where Chillagoe is today. Major earth movements folded and tilted the limestone and other inter-bedded sediments to an almost vertical position. Over long periods of geological time, the limestone above the ground has been eroded by water, forming a set of distinct landscapes, called karst. Today, this limestone appears as gaunt, pinnacled outcrops known as ‘bluffs’ or ‘towers’ that project up to 40 metres above the surrounding plains. The photographs shown here illustrate these limestone karst towers. 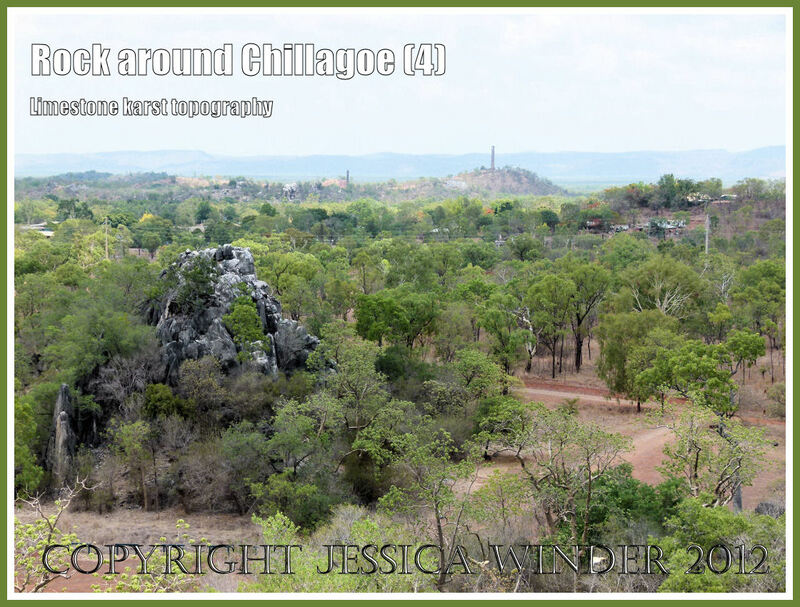 The first three images are of the massive rocky outcrop above the Royal Arch Caves. The last three photographs in the post show smaller isolated ‘towers’ dotted around the landscape, viewed from high up by the entrance of the Trezkinn Caves. Chillrox! Spectacular, and another triumph for limestone. Thanks, Sybil. 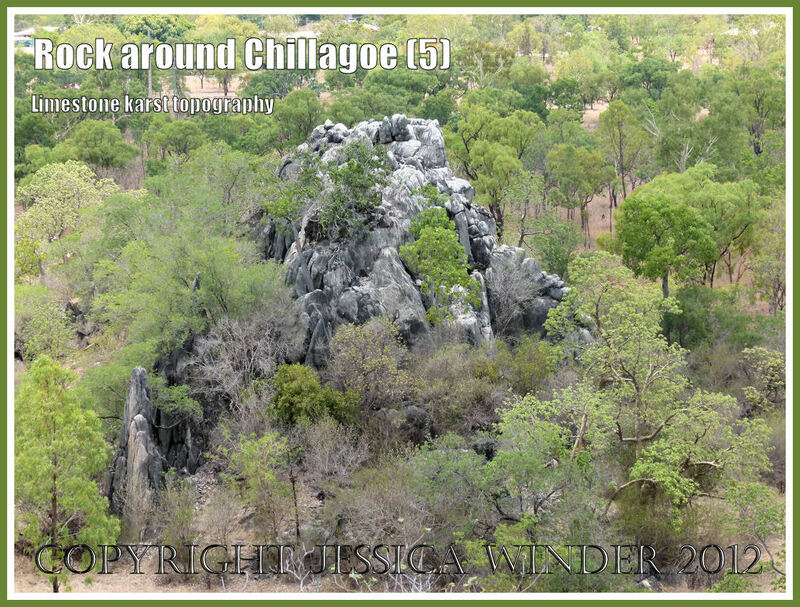 I will post some more pictures later – of caves, balancing rocks, and close-ups of erosional features, patterns in Chillagoe marble, and fossil brachiopods and crinoids.